While not human, “Cora Gated” was a female who was often seen in Sandusky in the 1950’s. 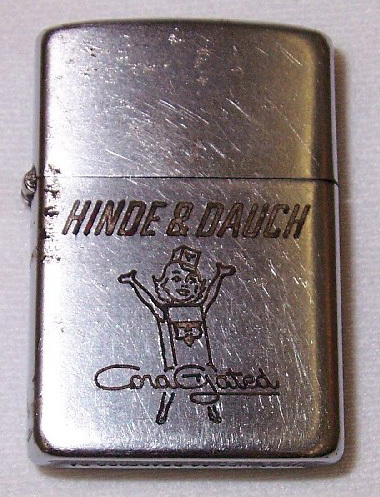 “Cora Gated” was a trademark of the Hinde and Dauch Paper Company, as seen on this silver lighter, which is now in the collections of The Follett House Museum. On February 24, 1953, the company filed for a trademark with the United States Patent and Trademark Office. “Cora Gated” was a representation of a woman wearing a cardboard box hat and clothing in the shape of a corrugated box, one of the primary products manufactured by Hinde and Dauch. The trademark was registered on April 27, 1954. Below are the several design codes associated with the “Cora Gated” trademark, which had the serial number 716442639.